The MCA Marketplace is sold out. To add your name to the waiting list, please email us at musicconferenceab@gmail.com. Thank you! Exhibitors receive 1 delegate pass for every $250 spent on booths. * Because they are in an unsecured area, booths 22-26 require disassembly on Friday evening and setup again Saturday morning. ​The Marketplace takes place at the Sutton Place Hotel in Edmonton. Upon arrival, please check in at the Registration Desk located at the door to the convention area. Your name badge, a conference program, and other pertinent information will be provided at that time. 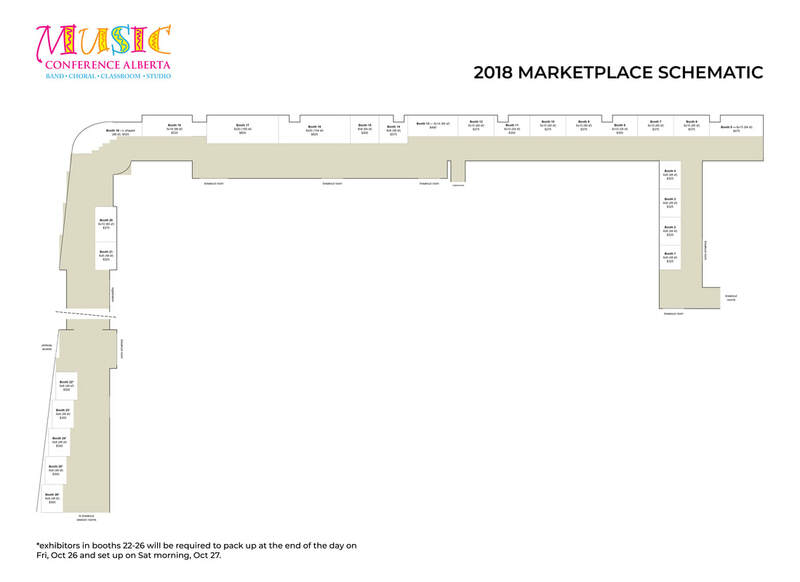 Load in for the Marketplace will take place on Thursday, 25 Oct 2018. As use of the freight elevator will be required, you will be assigned a load in time during which you will have priority use of the elevator. Booths are of varying sizes. Included in the price of your booth are one 6’ skirted table, two chairs, electricity, and wireless internet. Should you require additional tables, chairs, or other equipment, please contact us at musicconferenceab@gmail.com. You will receive 1 Exhibitor-Delegate Pass for every $250 spent on the cost of your booth (advertising costs are not included). Exhibitor-Delegate passes provide access to interest sessions, masterclasses, rehearsal labs, and keynote and plenary sessions. These passes can be shared by your booth personnel. Additional Exhibitor-Delegate Passes are available for $175. Should you need to ship product to the Sutton Place Hotel in advance of conference load in, please consult the Sutton Place Shipping & Receiving Information. Trade Fair Hours are Friday 8:30 a.m.-6:30 p.m. and Saturday, 8:30 a.m-3:30 p.m.
Each exhibitor will receive two complimentary tickets to the MCA Gala Concert (Friday, Oct 26, 8:00 p.m.). Additional tickets, along with tickets for other Alberta Emerging Musicians Festival concerts, can be purchased at www.musicconferenceab.ca. All exhibitors are invited to the President's Reception, held at the Sutton Place Hotel, on Fri, Oct 26, immediately following the Gala Concert performance (approximately 9:45 p.m.).